Human DR3 / TNFRSF25 Protein, Fc Tag (TN5-H5258) is expressed from human 293 cells (HEK293). It contains AA Gln 25 - Gln 199 (Accession # AAI17190). The protein has a calculated MW of 45.5 kDa. The protein migrates as 55 kDa under reducing (R) condition (SDS-PAGE) due to glycosylation. 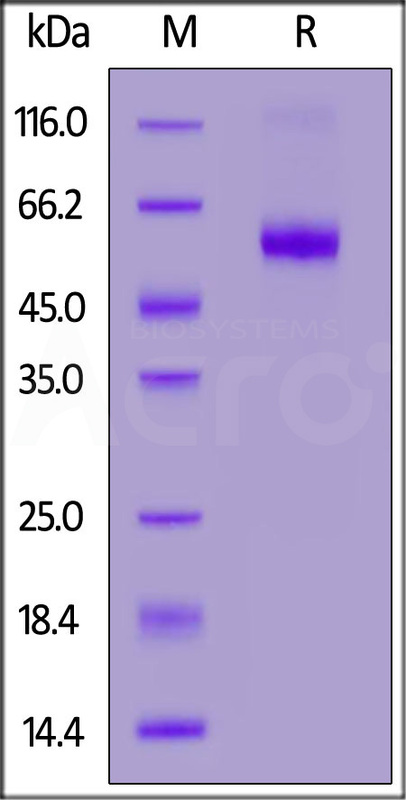 Human DR3 / TNFRSF25 Protein, Fc Tag on SDS-PAGE under reducing (R) condition. The gel was stained overnight with Coomassie Blue. The purity of the protein is greater than 95%. Tumor necrosis factor receptor superfamily member 25 (TNFRSF25) is also known as Apo-3, Death receptor 3 (DDR3 or DR3), Apoptosis-inducing receptor AIR, Apoptosis-mediating receptor TRAMP, Lymphocyte-associated receptor of death, Apo-3, which is a member of the TNF-receptor superfamily. TNFRSF25 is a homodimer protein, which can Interact strongly via the death domains with TNFRSF1 and TRADD to activate at least two distinct signaling cascades, apoptosis and NF-kappa-B signaling. TNFRSF25 is receptor for TNFSF12 / APO3L / TWEAK. (1) Kitson J., et al., 1996, Nature 384:372-375. (2) Bodmer J.-L., et al., 1997, Immunity 6:79-88. (3) Marsters S.A., et al., 1996, Curr. Biol. 6:1669-1676.